You can have organic lawn care that is safer and healthier for your family, pets, and the lawn all at an affordable price. Why Choose Organic Lawn Care? Your lawn will be healthier, the environment will be healthier, and you will be healthier by using organic lawn treatments. Our products are 100% natural, plant-derived, non-synthetic, certified organic whenever possible and SAFE! There are no hidden chemicals or pesticides to leach into your groundwater or to be absorbed by your children and pets. We have no requirements to stay off of your lawn after we apply our treatments because our products are completely SAFE for you, your children and your pets! Current events are showing that we are changing the way we view the Earth, the role we play in it, and our interconnection. One of the most important changes we can make is to debunk countless myths surrounding beauty. There is nothing more beautiful than a bright red ladybug making its way across a dewy reed; with natural lawn care, it is easier for children and adults to get close to natural phenomena like this with no fear. Our health and the health of our Planet are intertwined and to think otherwise is to close our eyes to an undeniable truth. Organic lawn care is the process of using natural and organic products in conjunction with proper lawn care techniques to establish and maintain a lawn that is lush and healthy and naturally resists pests, disease and weeds. Our approach to lawn care is primarily Soil Health. We take an environmentally friendly and holistic approach, using only organic materials, to treat poor soil and bring it back to health. Our approach is a long term investment in the health of your soil, the health of your family and pets, our employees and the local environment and wildlife. There are millions of microbes that live in your soil. As they feed on organic matter nutrients are made available to the grass. As the amount of organic matter increases the amount of microbes, and the nutrients they produce, increase. The more microbial activity there is in the soil the more healthier and stronger the grass grows. When you use organic fertilization & weed control methods, organic fertilizer, add organic amendments (such as gypsum and lime), top-dress with compost and leave grass clippings on your lawn, you are adding organic matter and contributing to a healthy microbe population. As your soil improves and the proper amendments are added an ecological balance is reached. The amount of inputs needed to sustain a healthy microbe population deceases and thus your need for fertilizers and other inputs decreases. This means you spend less time and money for a beautiful healthy lawn. We’ve come to identify these basic building blocks as either inorganic (synthetic) or organic. Inorganic fertilizers are used in traditional lawn care. More correctly, inorganic fertilizers are better described as soluble fertilizers. This means all they need is water to be available for plant absorption. Organic fertilizers have the same basic chemical make up as inorganics, except for this one important thing: they have not been processed to the degree that soluble fertilizers have been processed. For these organic fertilizers to be useful, they will need to go through an additional step before doing plants any good. That additional step is performed by microbes living in the soil. The rhizosphere stimulates microbial activity and microbes release compounds like organic acids, enzymes, and chelates that solubilize nutrients. This process breaks down organic matter. As microbes reach closer to the roots of your turfgrass, the roots stimulate the microbes into producing organic acids, enzymes and chelates that convert the organic nutrients into a solution that can then transfer from the soil into the root system and then fertilize your lawn. 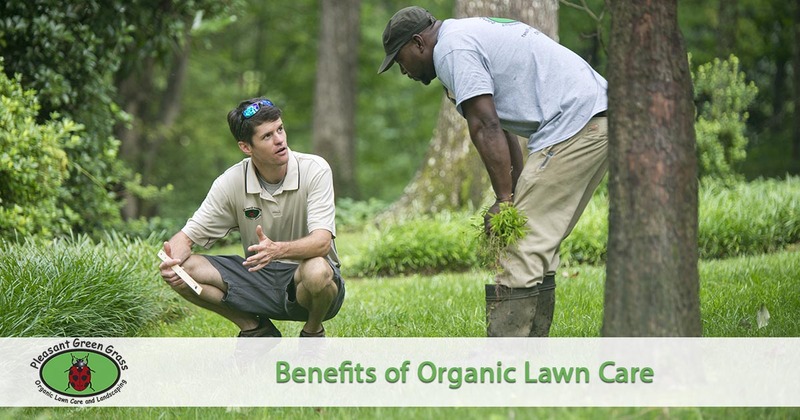 Ready to benefit from a organic lawn care program? Give Pleasant Green Grass a call today at 919-357-8245 or request a quote online. We make it easy to get your quote and schedule your service.